FastCommandTM Digital Disaster Response System will dispense mass communications and news at this location should an incident or disaster takes place. Bryan Health asks that regular updates and reviews be monitored through this disaster website. Just like having a working smoke detector in your home, having an emergency supply kit will put the tools you may need during an emergency or disaster at your fingertips. Be prepared to improvise and use what you have on hand to make it on your own for at least three days, maybe longer. While there are many things that might make you more comfortable, think first about fresh water, food and clean air. Plan to store items in an easy-to-carry bag, such as a shopping bag, backpack or duffle bag. Consider two kits. In one, put everything you will need to stay where you are and make it on your own. The other should be a lightweight, smaller version you can take with you if you have to get away. 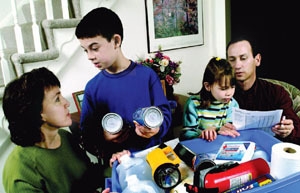 Do not postpone putting together your emergency kit because of cost; you can obtain these items over a period of time. Remember to rotate medications, water and food supplies to keep them fresh. Children, nursing mothers, and sick people may need more water. If you live in a warm weather climate more water may be necessary. Store water tightly in clean plastic containers such as soft drink bottles. Store at least a three-day supply of non-perishable food for each person. Select foods that require no refrigeration, preparation or cooking and little or no water. Include a manual can opener and eating utensils and disposable dishes. Avoid salty foods, as they will make you thirsty. Prescribed medical supplies such as glucose and blood pressure monitoring equipment and supplies. - Sterile dressings to stop bleeding. - Adhesive bandages in a variety of sizes. - Burn ointment to prevent infection. - Eye wash solution to flush the eyes or as general decontaminant. Two pairs of Latex, or other sterile gloves (if you are allergic to Latex). Household chlorine bleach and medicine dropper  When diluted nine parts water to one part bleach, bleach can be used as a disinfectant. Or in an emergency, you can use it to treat water by using 16 drops of regular household liquid bleach per gallon of water. Do not use scented, color safe or bleaches with added cleaners. Include copies of important documents in your emergency supply kits such as family records, medical records, wills, deeds, social security number, charge and bank accounts information and tax records. Have copies of your medical insurance and Medicare cards readily available. Keep a list of the style and serial number of medical devices or other life-sustaining devices. Include operating information and instructions. Make sure that a friend or family member has copies of these documents. Include the names and contact information of your support network, as well as your medical providers. Keep these documents in a water proof container for quick and easy access. This kit should be in one container, and ready to "grab and go" in case you are evacuated from your workplace, maybe a small backpack. Make sure you have food and water in the kit. For a smaller school or work emergency kit, you could include 1 drink pouch, 1 glow stick, some Band-Aids, and 1 mask inside a water bottle. In case you are stranded, keep an emergency supplies kit in your car. 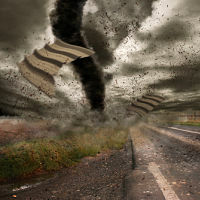 Include food, water, first aid supplies, flares, jumper cables, and seasonal supplies. Your family may not be together when a disaster strikes, so plan how you will contact one another and where you will meet following the disaster. Consider a plan where each family member calls, or emails, the same friend or relative in the event of an emergency. It may be easier to make a long distance call than a local call, so an out of town contact may be included. Be sure each person has a prepaid phone card or coins. It may be difficult to make a call, just be patient and keep trying. 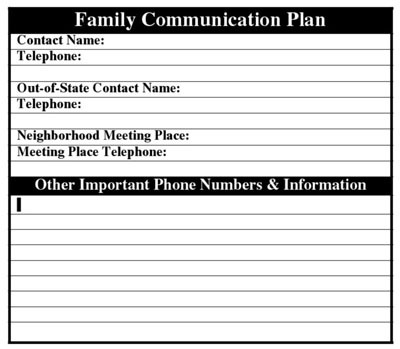 See the last page for a form to document your family communication plan. 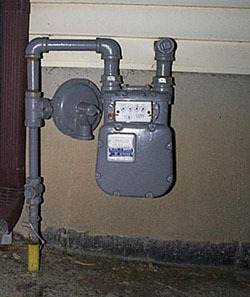 Locate the electric, gas and water shut-off valves. Keep necessary tools near gas and water shut-off valves. There may be conditions under which you will decide to get away, or there may be situations when you are ordered to leave. Plan how you will assemble your family and anticipate where you will go. Choose several destinations in different directions so you have options in an emergency. If you have a car, keep a half tank of gas in it at all times in case you need to evacuate. If you do not have a car, plan how you will leave if you have to. Take your pets with you, but understand that only service animals may be permitted in public shelters. Plan how you will care for your pets in an emergency. Call or email the "out-of-state" contact in your family communications plan. Tell them where you are going. If there is damage to your home and you are instructed to do so, shut off water, gas and electricity before leaving. Whether you are at home, work or elsewhere, there may be situations when it's simply best to stay where you are and avoid any uncertainty outside. There are other circumstances when staying put and creating a barrier between yourself and potentially contaminated air outside, a process known as "sealing the room," is a matter of survival. Use available information to assess the situation. If you see large amounts of debris in the air, or if local authorities say the air is badly contaminated, you may want to take this kind of action. 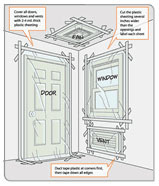 To "Shelter in Place and Seal the Room"
Seal all windows, doors and air vents with plastic sheeting and duct tape. Consider measuring and cutting the sheeting in advance to save time.